While on holiday in Lisbon last year I visited the Calouste Gulbenkian museum. It is a wonderful museum and houses an outstanding collection of carpets, hangings and ceramics from the Ottoman Empire. In particular some beautiful ceramic tiles from Iznik. I loved them all, but especially the elongated tulips which seemed to be a feature of tiles from Iznik. Anyway I decided that I just had to try and emulate this work in embroidery. The resulting piece is now finished and in a frame. Here it is. The fabric is a very fine linen, which I worked on without a backing, probably a mistake, but there you go. The tulip flowers are all stitched with Glissen Gloss Colorwash silk threads. These are very fine variegated threads which come in 12 strands. I used four for the embroidery. Three of the tulips are stitched in Strawberry Sherbet and three in Coral Blush. Long and short stitch was used throughout. The stems consist of rows of heavy chain stitch. The calyx is made up of padded closed leaf stitch. All stitched with two strands of cotton. I included the flowers in the centre to add a bit of variety to the composition. The outer layer of the larger flowers are also stitched with Glissen Gloss Colorwash silk. This time in Blueberry, again using four strands. The other layers and the smaller flower are all stitched with two strands of au ver à soie threads in dark blue, light blue and red. The outer layers use satin stitch, while the centres are filled with padded satin stitch. The composition was designed to fit into an old frame that I bought second hand. It had a brownish oval shaped paper mount. Unfortunately I made a mess of this mount while applying some glue. So I quickly tried to remedy this by cutting out another oval mount in purple. It fits the frame all right, but not sure of the colour. I enjoyed working on this piece and really like the Colorwash silk threads. Now have a mini collection of these threads. All awaiting a bit of inspiration. 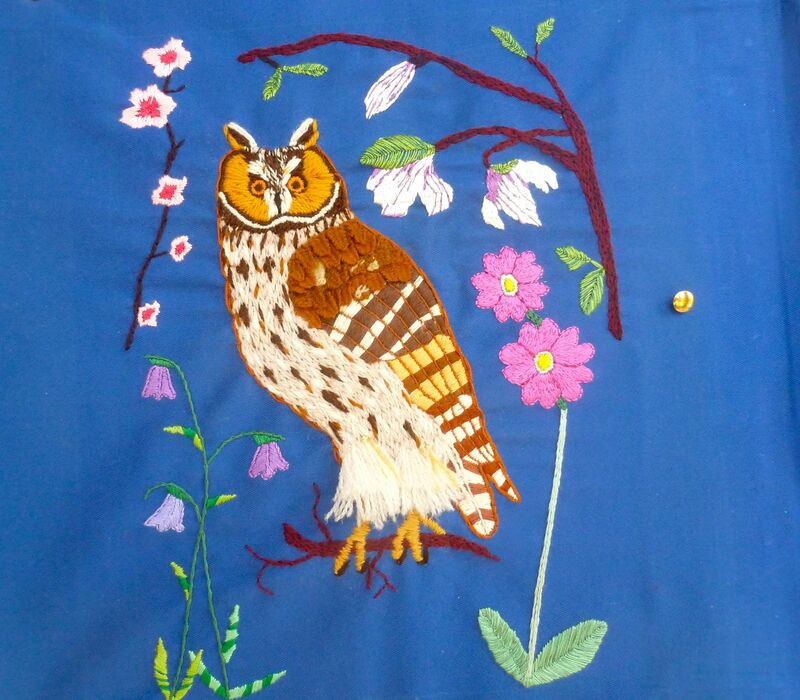 I have at long last completed the owl with its surrounding flowers. One of the longest stitching projects I have undertaken. This one involved some 80 hours of stitching. Then I am not the world’s fastest stitcher. Regular, but a bit on the slow side. Anyway here is the finished piece. I wanted the surround to be representative of spring and to have some kind of Scottish connection. Thus the two flowers on the bottom are the Scottish bluebell and the Scottish primrose. Bluebells are fairly common, not just in Scotland of course, but I love their little bell shape and their colours. The Scottish primrose on the other hand is nowadays a very rare specimen. It is only found in Caithness and the Orkney islands. It has a lovely tall stem and the flowers are all in the one colour. The other two flowers – magnolia and cherry blossom – are not Scottish in any way, though they are both very popular here. I just love both. For the branches of the magnolia and the cherry blossom I used appleton wool and everything else was stitched with two strands of DMC cotton. The leaves of the primrose and the magnolia are stitched in closed fly stitch. This was another first for me and is a handy stitch for leaves as you generate the middle ridge as you stitch. The petals were done with either satin stitch or long and short stitches. The finished fabric is alas, somewhat wrinkled. All that pulling of threads, especially the wool threads has resulted in a bunching up of the fabric around the body of the owl. Can’t be helped now. I suppose it gives the piece a real craft feel to it – unprofessional and unpolished. It is now with Lesley, my framer, to finish it all off. I am now planning to work on two projects over the coming months. I want to continue with this type of embroidery work. I have just bought a piece of light linen/cotton fabric in a neutral colour. Not quite sure what design to use at the moment. I would like to do something in Art Nouveau style or something based on the works of Gustav Klimt. But a bit more research is needed first. At the same time I will be working on another project using traditional Palestinian motifs. I have worked out the overall composition and with luck it will end up as a cover for my ipad. Starting to get a bit practical with my stitching now. Happy Easter to all and happy stitching!